Cerf was born in New Haven, Connecticut, the son of Muriel (born Gray), a housewife, and Vinton Thurston Cerf, an aerospace executive. 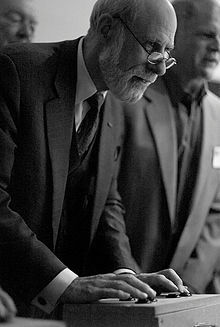 Cerf went to Van Nuys High School in California along with Jon Postel and Steve Crocker; he wrote the former's obituary. Both were also instrumental in the creation of the Internet. While in high school, Cerf worked at Rocketdyne on the Apollo program, including helping to write statistical analysis software for the non-destructive tests of the F-1 engines. Cerf's first job after obtaining his B.S. degree in mathematics from Stanford University was at IBM, where he worked for two years as a systems engineer supporting QUIKTRAN. He left IBM to attend graduate school at UCLA where he earned his M.S. degree in 1970 and his PhD degree in 1972. During his graduate student years, he studied under Professor Gerald Estrin, worked in Professor Leonard Kleinrock's data packet networking group that connected the first two nodes of the ARPANet, the first node  on the Internet, and "contributed to a host-to-host protocol" for the ARPANet. While at UCLA, he also met Bob Kahn, who was working on the ARPANet hardware architecture. After receiving his doctorate, Cerf became an assistant professor at Stanford University from 1972–1976, where he conducted research on packet network interconnection protocols and co-designed the DoD TCP/IP protocol suite with Kahn. Cerf then moved to DARPA in 1976, where he stayed until 1982. Cerf is chairman of the board of trustees of ARIN, the Regional Internet Registry (RIR) of IP addresses for United States, Canada, and part of the Caribbean. Until Fall 2015, Cerf chaired the board of directors of StopBadware, a non-profit anti-malware organization that started as a project at Harvard University's Berkman Center for Internet & Society. Cerf is on the board of advisors to The Liquid Information Company Ltd of the UK, which works to make the web more usefully interactive and which has produced the Mac OS X utility called 'Liquid'. Vint Cerf is a member of the CuriosityStream Advisory Board. During 2008, Cerf chaired the Internationalized domain name (IDNAbis) working group of the IETF. In 2008 Cerf was a major contender to be designated the US's first Chief Technology Officer by President Barack Obama. Cerf is the co-chair of Campus Party Silicon Valley, the US edition of one of the largest technology festivals in the world, along with Al Gore and Tim Berners-Lee. From 2009 to 2011, Cerf was an elected member of the Governing Board of the Smart Grid Interoperability Panel (SGIP). SGIP is a public-private consortium established by NIST in 2009 and provides a forum for businesses and other stakeholder groups to participate in coordinating and accelerating development of standards for the evolving Smart Grid. Cerf was elected to a two-year term as President of the Association for Computing Machinery (ACM) beginning July 1, 2012. In 2015 Cerf co-founded (with Mei Lin Fung), and is currently chairman of, People-Centered Internet (PCI). On January 16, 2013, US President Barack Obama announced his intent to appoint Cerf to the National Science Board. In June 2016, his work with NASA led to Delay-tolerant networking being installed on the International Space Station with an aim towards an Interplanetary Internet. Since at least 2015, Cerf has been raising concerns about the wide-ranging risks of digital obsolescence, the potential of losing much historic information about our time – a digital "dark age" or "black hole" – given the ubiquitous digital storage of text, data, images, music and more. Among the concerns are the long-term storage of, and continued reliable access to, our vast stores of present-day digital data and the associated programs, operating systems, computers and peripherals required to access such. In May 2011, he was awarded an HPI Fellowship as "...a tribute to his work for a new medium which influenced the everyday life of our society like no other one." Cerf writes under the column name "CERF'S UP", and Cerf's car has a vanity plate (registration) "CERFSUP". ^ "Governing Council - IIIT Hyderabad". www.iiit.ac.in. ^ a b Cerf, Vinton (1972). Multiprocessors, Semaphores, and a Graph Model of Computation (PhD thesis). University of California, Los Angeles. OCLC 4433713032. ^ (see Interview with Vinton Cerf Archived June 9, 2007, at the Wayback Machine, from a January 2006 article in Government Computer News), Cerf is willing to call himself one of the internet fathers, citing Bob Kahn and Leonard Kleinrock in particular as being others with whom he should share that title. ^ Cerf, V. G. (2009). "The day the Internet age began". Nature. 461 (7268): 1202–1203. doi:10.1038/4611202a. PMID 19865146. ^ "ACM Turing Award, list of recipients". Awards.acm.org. Archived from the original on December 12, 2009. Retrieved December 2, 2011. ^ "IEEE Alexander Graham Bell Medal". Ieee.org. July 7, 2009. Retrieved December 2, 2011. ^ "Advisory Board" Archived September 17, 2013, at the Wayback Machine, Council on CyberSecurity website. Retrieved September 27, 2013. ^ Ghosh, Pallab. "Google's Vint Cerf warns of 'digital Dark Age'". BBC News. BBC. Retrieved February 13, 2015. ^ Jerome, Richard (September 18, 2000). "Lending An Ear – Health, Real People Stories". People. Retrieved December 2, 2011. ^ "Vinton Gray Cerf Biography". BookRags.com. Retrieved December 2, 2011. ^ Wientjes, Greg (2011). Creative Genius in Technology : Mentor Principles from Life Stories of Geniuses and Visionaries of the Singularity. p. 93. ISBN 978-1463727505. ^ "UCLA School of Engineering Alumnus Chosen for Prestigious Turing Award". UCLA Henry Samueli School of Engineering and Applied Science. Spring 2005. Archived from the original on March 5, 2006. ^ a b "Internet predecessor turns 30". CNN. September 2, 1999. Archived from the original on July 25, 2008. ^ a b c "INTERNET PIONEERS CERF AND KAHN TO RECEIVE ACM TURING AWARD". ACM. February 16, 2005. ^ "Vinton Cerf – Father of the Internet, Vinton Cerf". Deafness.about.com. August 28, 2010. Retrieved December 2, 2011. ^ "Board of Associates". Gallaudet University. Archived from the original on April 7, 2014. Retrieved April 3, 2014. ^ Socks the Whitehouse Cat (February 19, 2005). "Re: ACM ethics complaint against Cerf – first draft". Newsgroup: comp.org.acm. Retrieved June 9, 2014. ^ McWilliams, Brian (February 16, 2005). "Protest brewing against Internet pioneer". Spam Kings Blog. Retrieved June 9, 2014. ^ Socks the Whitehouse Cat (February 25, 2005). "ACM ethics complaint against Cerf – first draft". Newsgroup: comp.org.acm. Retrieved June 9, 2014. ^ "ICANN Board of Directors – Vinton G. Cerf". Icann.org. February 14, 2011. Retrieved December 2, 2011. ^ "Eurasia Group". Eurasia Group. Archived from the original on September 28, 2011. Retrieved December 2, 2011. ^ "The InterPlaNetary Internet Project IPN Special Interest Group". Ipnsig.org. Retrieved December 2, 2011. ^ "Testimony before the U.S. Senate Committee on Commerce" (PDF). Retrieved December 2, 2011. ^ "ARIN Announces Newly Elected Board of Trustees". Arin.net. Retrieved December 2, 2011. ^ "Board of Directors". StopBadware. Retrieved January 19, 2013. ^ "Harvard's Berkman Center and the Oxford Internet Institute Unveil StopBadware.org Backed by Google, Lenovo, Sun; Consumer Reports WebWatch Takes Unpaid Special Advisor Role". StopBadware. January 23, 2006. Retrieved December 2, 2011. ^ "The Liquid Information Company". Liquid.info. Retrieved July 1, 2013. ^ "IDNAbis WG". Tools.ietf.org. Retrieved December 2, 2011. ^ "The 5 best jobs Obama has yet to fill – Craig Gordon and Ben Smith". Politico.Com. December 4, 2008. Retrieved December 2, 2011. ^ Daniel Ben-Horin (November 21, 2011). "The Kids Are Alright: Campus Party, Silicon Valley Tech Festival Rocks NASA". Huffington Post. Retrieved March 6, 2013. ^ "Smart Grid Interoperability Panel Launched; Governing Board Elected". Retrieved November 19, 2009. 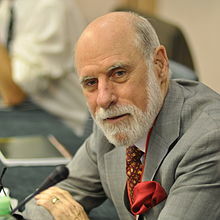 ^ "ACM Elects Vint Cerf as President". ACM. Archived from the original on May 26, 2012. Retrieved May 25, 2012. ^ "Economies grow far better with inclusivity and compromise". DailyNation. November 23, 2015. Retrieved February 28, 2018. ^ "President Obama Announces More Key Administration Posts". Retrieved January 20, 2013. ^ "Governing Council". International Institute of Information Technology, Hyderabad. Retrieved April 18, 2016. ^ Mahoney, Erin (June 21, 2016). "Space Internet Technology Debuts on the International Space Station". ^ Dartnell, Lewis (February 16, 2015). "The digital black hole: will it delete your memories?". the Guardian. Retrieved November 11, 2018. ^ Noyes, Katherine. "Vint Cerf fears a 'digital dark age,' and your data could be at risk". Computerworld. Retrieved November 11, 2018. ^ "Internet Pioneer Warns Our Era Could Become The 'Digital Dark Ages'". NPR.org. Retrieved November 11, 2018. ^ Ghosh, Pallab (February 13, 2015). "Net pioneer warns of data Dark Age". BBC News. Retrieved November 11, 2018. ^ "Vinton Cerf M.S. '70, PhD '72 | UCLA Alumni". Alumni.ucla.edu. Retrieved December 2, 2011. ^ "SIGCOMM Awards". Sigcomm.org. Retrieved December 2, 2011. ^ "Office of Science and Technology Policy | The White House". Ostp.gov. Retrieved December 2, 2011. ^ "National Medals of Science and Technology Foundation". ^ "Vinton Cerf". Computer History Museum. Archived from the original on July 2, 2013. Retrieved May 23, 2013. ^ "ACM: Fellows Award / Vinton G. Cerf". amturing.acm.org. June 4, 2011. Retrieved December 2, 2011. ^ "ISOC-Bulgaria: IT-delegation in Sofia". Isoc.bg. Retrieved December 2, 2011. ^ FiveYear. "Vint Cerf's Top YouTube Videos". Youtube. Retrieved December 2, 2011. 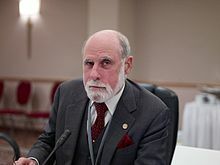 ^ "Vinton G. Cerf, who developed together with Robert E. Kahn the TCP/IP protocol was awarded as a HPI Fellow on May 25th 2011. The HPI award is a tribute to his work for a new medium which influenced the everyday life of our society like no other one." "HPI Fellows & Guests". Archived from the original on May 20, 2011. Retrieved May 27, 2011. ^ British Computer Society. "Vint Cerf named BCS Distinguished Fellow". Retrieved September 28, 2011. ^ "62nd Bernard Price Memorial Lecture". South African Institute of Electrical Engineers (SAIEE). September 5, 2013. Retrieved September 25, 2015. ^ "Bearers of decorations – Vinton Gray Cerf". Retrieved September 25, 2015. 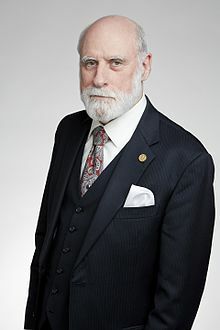 ^ "Vinton Cerf Appointed an Officer of the Legion of Honor". ^ "Vinton Gray Cerf". November 2, 2017. ^ "Vinton Cerf, un dels pares d'internet, premi Internacional Catalunya 2018". 324. January 9, 2019. ^ Thomas C Greene (October 2, 2000). "Net builders Kahn, Cerf recognise Al Gore: Grateful for the inventor's genius". The Register (UK). Archived from the original on December 13, 2013. Retrieved December 2, 2011.